Can you believe it’s August already? Yeah, neither can I. This summer has been spectacular so far, and as a result has gone by too fast. WAY too fast. The good news is that right about now, some of my favorite summer produce is coming into season. I’m talking about tomatoes and sweet corn. So now is the time to take advantage of these tasty veggies; at the rate this summer is flying by, they’ll be gone before you know it! Over the last week or so, the golden cherry tomato plant in my garden has been so prolific, I’ve collected a couple of pints per week! And my Brandywine, Mr. Stripey, and Cherokee Purple heirlooms aren’t far behind (Mr. Stripey? Is that not the best name for a tomato ever?). Sadly, my garden is not large enough to grow sweet corn, but fear not, the farmer’s market is overflowing with it! So what to do with all this marvelous produce? After a week of grilling meats and baking cakes, I figured a nice salad was in order. This salad is a great vehicle for enjoying all of the deliciousness that is summer - tomatoes, grilled corn, goat cheese, and basil vinaigrette. It doesn’t get much better than that. This salad makes a great grilling side dish (plus you can grill the corn at the same time as your other grilled fare - some banh burgers perhaps?). Or, you can add grilled shrimp or chicken and make it into a summery meal of its own. 1. To make dressing, combine basil through vinegar in a bowl and whisk thoroughly until mixed. Or to make things even easier, you can put the ingredients in a jar, screw on the lid, and shake until combined. Season with salt and pepper. 3. Remove corn from grill, allow to cool briefly, then cut the kernels off the cob. 4. 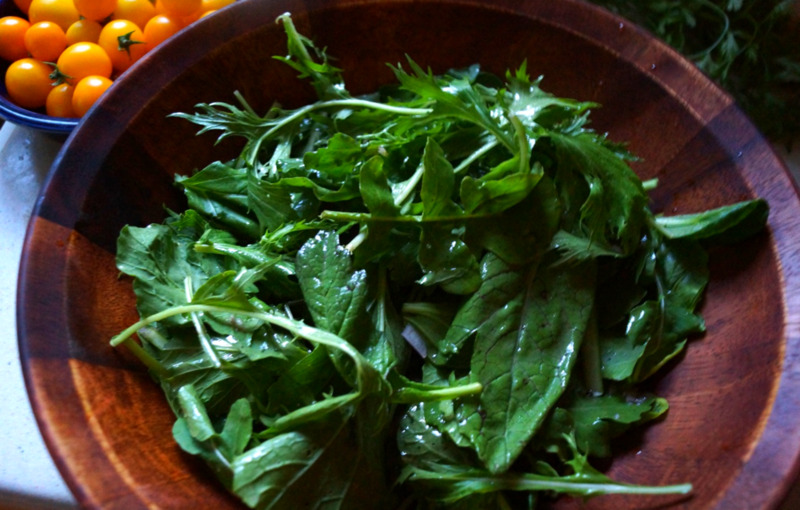 Place salad greens in a large bowl add dressing and toss to coat greens. Top with the corn kernels and cherry tomatoes. Crumble the chevre on top. *I like to grill my corn for this salad, because I like the smokiness it adds. But, if you aren't in the mood to fire up the grill, don’t worry! You can also cook the corn in your oven under the broiler. Here’s how to do it: Turn the broiler in your oven on high. Shuck the corn and put the ears on a sheet pan. Put the sheet pan on the top rack of your oven, and let the corn cook for about 8-10 minutes, or until the kernels on the top side of the corn start to turn golden brown. Then, turn the ears of corn ½ turn to brown the other side, and cook an additional 5 minutes, or until the kernels on this side turn golden brown. Remove from the oven, cool slightly, then cut the kernels off to add to the salad.